When you think of a baby first meeting their dad, you probably don't think it includes snarling and growing. Well, unless that baby is a lion cub, of course. In footage captured by the Oregon Zoo, viewers get the rare opportunity to see what it's like for a lion to meet his cubs for the first time. It's clear that the three cubs are completely interested in their 500-pound papa, Zawadi Mungu , but he wastes no time laying down the law. As they playfully jump on him and sniff his mane, he snarls and bears his teeth. An interesting welcome, to say the least. However, when it comes to lion dad's, this one is pretty patient. While it may be scary to to see him show his full set of chompers, he doesn't actually bite or claw at them. Laura Weiner, lead Africa keeper told Fox 12 Oregon, "We were confident that Zawadi would be tolerant of his cubs right away, and we're glad we were right because the cubs rushed him as soon as they saw him." 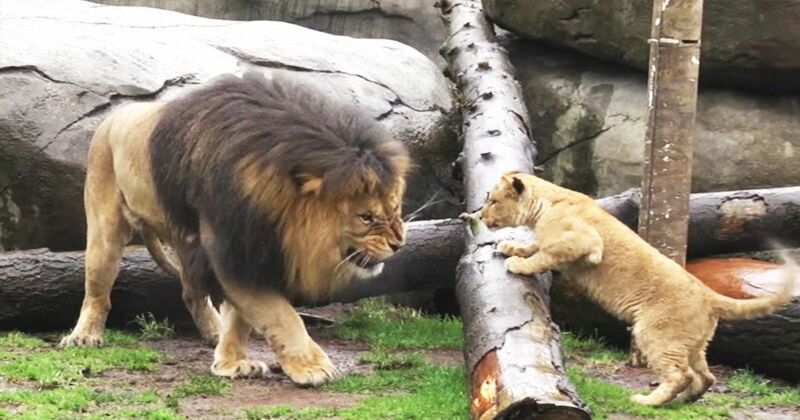 In fact, because of his abundant patience, the Oregon Zoo actually named the lion dad "Father of the Year" as he continues to allow his cubs to practice their hunting and stalking skills on him. Visitors can also catch him grooming and snuggling the cubs, too! Romping around and testing their parent's patience--doesn't sound much different than human children! Be sure to catch a peek of the cubs meeting their dad.